We look at steam cleaning grout and how you can use a grout steam cleaner to quickly get rid of dirt and stains. Grout maintenance may seem like a hassle but with our reviews and tips it will surely make your life and grout cleaning much easier. It is the material that is applied between your tiles to fill in the spaces and strengthen the entire tile structure. Grout can come in many types, colors and textures to complement your specific tile design and color. It definitely serves more that just a utilitarian purpose but also an aesthetic one. Grout is a porous material and as a result easily absorbs dirt and grease. Cleaning grout is something which should be done on a regular basis, in the same way that you clean your carpets and floors. It is very important to have your grout lines sealed to better protect them from absorbing the dirt. However, this mustn’t be your only cleaning method! Tiling has become a popular method of flooring throughout the home and outside. In the kitchen your grout would be exposed to grease, food stains, dirt and grime because it is a high trafficked area. The bathroom’s grout would be susceptible to mold, mildew, soap scum, urine stains and more. There are many ways in which you can remove grout dirt and grime. • Use Vinegar or Baking Soda. The vinegar can be diluted with an equal amount of water, or a paste of baking soda and water can be made. This should then be scrubbed onto the grout with a stiff brush. Be careful not to use a steel brush as this would wear away your grout. Don’t use an old toothbrush as the bristles would be too soft to clean properly. You should scrub in circles as oppose to along the line because this will extract more dirt out of the grout. • Household cleaners like Lysol or Mr. Clean can be used in the same manner as above. • You can also use bleach diluted with water on white grout. Please don’t use bleach on colored grout as it will definitely cause discoloring! Do make sure that the room is well ventilated while you’re cleaning with strong chemicals. • If you want a safe and effective way to clean your grout, you should use the natural Oxy-Grout Grout Cleaner, it contains the power of Oxy-Boost and specially formulated cleansers to safely cleans your grout and gets rid of mold and mildew. Oxy-Grout contains a special activator to increase cleaning efficiency. Oxy-Grout does not contain harmful acids or chlorine bleach. Oxy-Grout has no dangerous noxious odors. Oxy-Grout contains NO phosphates, dyes, perfumes, or fillers. The above methods are great for grout cleaning but they are quite tedious and tiring! Scrubbing away at your grout lines will take hours which can be avoided if you have the right tools to help you along. Another fast and easy way to clean your grout is to use a grout steam cleaner. Steam cleaners do an excellent job when it comes to cleaning grout. Most steam cleaners are multi purpose machines and come with various attachments which you can use for different applications. Make sure and buy a cleaner with a small detail brush attachment which can be used to apply hot high pressured steam to your grout. This will cause the dirt to surface from deep within the pores of the grout which you can then simply wipe off with a towel. Definitely no scrubbing action required! Using a Tile Grout Steamer Cleaner is the simplest, easiest and most effective way of quickly cleaning and sanitizing your grout lines. 1. Buy or rent a steam cleaner like one of the recommended models below or a machine that has multi purpose applications. 2. Clear the area that you need to clean. This may involve temporarily re arranging some furniture so that all grout lines are exposed. 3. Sweep the area to remove any surface dust and then lightly mop the area or use a damp cloth. 4. Set up the steam cleaner according to the directions until it is ready to be used. Make sure and attach the correct attachment, one that allows for a small concentrated flow of steam. 5. Then work through the area, concentrating the head of the attachment along the grout lines. Move slowly up and down repeatedly along the grout and wipe the surfaced dirt away with a towel. 6. Once the floors or the area is clean, you can then apply a grout sealant on the grout. This will ensure your grout stays clean for much longer and protects it from absorbing dirt longer than unsealed grout. Below are a few steam cleaners that can be used for steam cleaning grout that we and consumers recommend as the best steam grout cleaners. This steamer is one of the best, most positively reviewed grout steam cleaners that are on the lower end of the price range. Paying well under $150 is definitely not a bad price for this heavy duty machine which many consumers recommend. It comes with a wide array of attachments and is proven to clean grout effectively. Read the full review of the McCulloch Mc 1275 here. This cleaner cleans grout with a dramatic flair. After you’ve used this steamer on those grout lines, you’ll never go back to back breaking scrubbing. It works well on kitchen and bathroom floors. Some consumers have even gone so far to call it a “dream come true” for their grout lines and bathrooms that were overcome by soap scum. The Wagner cuts through the dirt like butter. At under $100 this is great value for money. 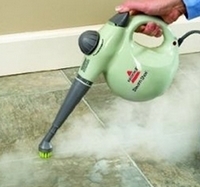 This handheld steam cleaner is very handy when you need a light weight steamer for quick cleaning that is easy to handle but will do a good job at cleaning grout. You can expect about 20 minutes of steam time after 3 minutes of heating up the water. It delivers more than adequate results and can also be used for many other cleaning jobs around your home. Read about the Steam Shot here.